Local authors who have published books, and those who have books ready to publish, will be at the Mars Hill Coffeehouse, 610 San Benito St., on Saturday, Nov. 5 from 11 a.m – 3 p.m. 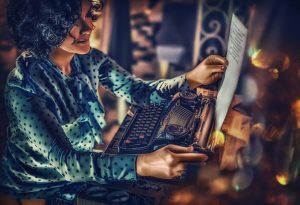 The writers will share what their experience has been to write, and those who have been published will share that experience, as well. Authors with published books will have those titles available for purchase. 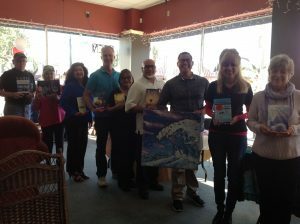 Ramona Trevino, the organizer of the author event, and a recently-published author, told BenitoLink that she had a desire to highlight local authors. Timothy Pipes – Bay of Deceptions – his first published book – and Earth Shift, published in Aug. 2016. Pipes is a San Benito High School counselor. Debra Gutierrez, the founder of Lyme Disease Awareness Foundation, has a soon-to-be-published book that chronicles her daughter’s missed diagnoses. I.M. Dauntless, will speak about her book, Free at Last: The Struggle to be Good Enough. She says this is the first of many books yet to be written. Jim Ostdick, a retired science teacher, blogs, “REACH Across America” and authored the book, Palomino and the Dream Machine: a retired Dude’s Bicycle Tour Around the Lower Forty-eight United States. Leta Rae Pereira, a volunteer peer counselor, wrote the book of poetry, The Message Maker. Matthew Raymond, a San Benito High School English teacher, has had work in a variety of literary journals. The Muddy Season, his first, fiction chap-book, was recently published by Black Lawrence Press. Jay Steel, founder of Graffiti Greetings, about street artists from around the world, writes poetry, that will soon be released. Edgardo Luis Pastora – a vibrant artist who “paints with a passion,” was featured at the Bryson Tiller tribute Trapxart in San Francisco.